Video games have seemingly taken over our lives. Whereas gamers once constituted a small and largely male subculture, today 67 percent of American households play video games. The average gamer is now thirty-four years old and spends eight hours each week playing--and there is a 40 percent chance this person is a woman. In Bit by Bit, Andrew Ervin sets out to understand the explosive popularity of video games. He travels to government laboratories, junk shops, and arcades. He interviews scientists and game designers, both old and young. In charting the material and technological history of video games, from the 1950s to the present, he suggests that their appeal starts and ends with the sense of creativity they instill in gamers. As Ervin argues, games are art because they are beautiful, moving, and even political--and because they turn players into artists themselves. Andrew Ervin is the author of Extraordinary Renditions and Burning Down George Orwell's House. He has written essays and reviews for the New York Times Book Review, Chicago Tribune, San Francisco Chronicle, and others. He teaches part time at Temple University and lives with his wife in Philadelphia, Pennsylvania. "Andrew Ervin slaloms through their cultural and technological history, from physicist William Higinbotham's 1958 analog simulation Tennis for Two to Atari classics, arcade stalwart Pac-Man and the Warcraft franchise. Ervin even plays the original games, research that involves the installation of vintage computer drives and an 'obscenely loud' Donkey Kong machine. A vivid foray into alternative worlds." "Literary and playful... 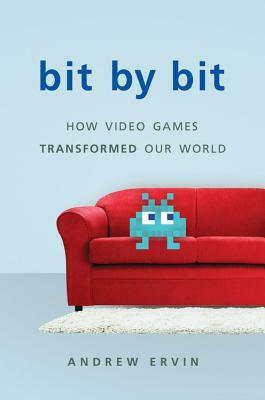 Bit by Bit provides a fascinating exploration of the world of video games, their history and importance to modern culture."